Palette Auto-hide Speed is a freeware app for AutoCAD. Did you know that you can change the time it takes to show/hide or roll-up/roll-out the palette windows in AutoCAD, AutoCAD Architecture or other verticals when you have activated Auto-hide? It is possible but is not so obvious and easy. Until now. Hoover the mouse over "Tip here" in the application for a useful tip. Run JTBWPaletteAutoHideSpeed and then close AutoCAD. Make changes to the settings, press OK and start AutoCAD to see the effect on palettes that are set to Auto-hide. Roll-up speed is the time it takes to show the palette. Roll-out is the time it takes to hide the palette. The “holdopen” delay is an additional delay that keeps the palette open for a specified time when it is opened programmatically; if the mouse does not move over it in this time it automatically rolls back up. The animation shows with Roll-up and Roll-out set to 0 to speed it up as much as possible. Set Roll-up to 0 (or higher if he want the palette to stay open longer after moving away from it) and Roll-out to a high value like 5000. Using this trick you either will need to click on the title bar of the palette to show it or wait 5 seconds hovering over it before it rolls out. Here’s an animation showing how it works and notice that just moving the mouse over the bar does not open the palette. It is first when clicking on the bar that the palette is opened. There is no support for this freeware but if you run into any problems or have any questions it's free to ask and we might be able to do something about it. If you go in there and change the Roll-up speed it will not work because of a minor spelling error. (Update: This has been corrected in ADT 2007) You also have to change PalleteRollupInfo to PaletteRollupInfo. The spelling error is corrected by the application. In AutoCAD there is no existence of these rows so they have to be added at the correct location. But is does not affect all palettes. You can see the effect with the palettes Properties, Quickcalc, External References, Sheet Set Manager, Markup Set Manager, Shared Views, Visual Styles Manager set to auto-hide. Try for example CTRL+1 one or two times. But it seems to only affect External References when starting AutoCAD. 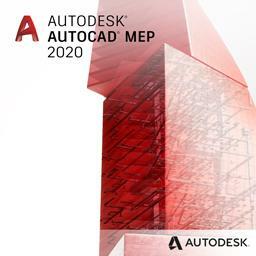 Compatible with all existing AutoCAD based versions and verticals that uses palettes. Example of palettes: Tool Palettes, Command Line, Layer Properties, DesignCenter, Properties, Quickcalc, External References, Sheet Set Manager, Markup Set Manager, Visual Styles Manager, Drawing Recovery Manager, Block Authoring Palette, Parameters Manager, Design Feed, Shared Views. Palette Auto-hide Speed can be downloaded and installed as an app from the Autodesk App Store site. 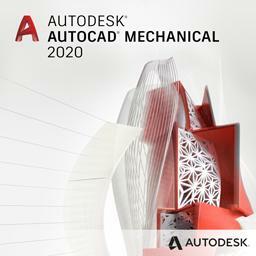 Support for AutoCAD 2012 to AutoCAD 2020 including verticals. 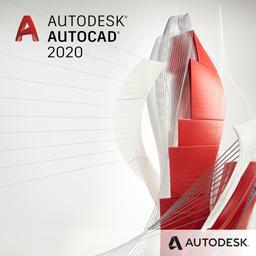 Some have reported that AutoCAD 2011 and AutoCAD 2012 might have problem to accept some of the settings. 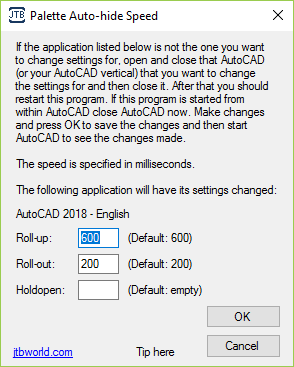 If you have older versions or if AutoCAD LT is used you need to manually run the app that is installed in "%appdata%\Autodesk\ApplicationPlugins\JTBW-PaletteAutoHideSpeed.bundle\Contents\Windows\PaletteAutoHideSpeed.exe". Example: "C:\Users\jtb\AppData\Roaming\Autodesk\ApplicationPlugins\JTBW-PaletteAutoHideSpeed.bundle\Contents\Windows\PaletteAutoHideSpeed.exe"
Subscribe to our Palette Auto-hide Speed newsletter or any of our other Newsletters. 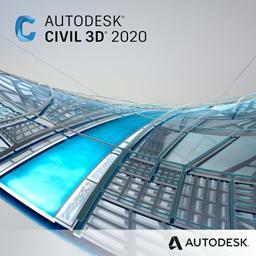 Compatible with all AutoCAD versions (AutoCAD versions up to AutoCAD 2020). All flavors based on AutoCAD should be working like AutoCAD Architecture (ACA), Architectural Desktop (ADT), AutoCAD Civil 3D, AutoCAD Electrical , AutoCAD Map 3D, AutoCAD Mechanical, AutoCAD MEP (AMEP, ABS), AutoCAD P&ID, AutoCAD Plant 3D. Works with AutoCAD LT too. Windows XP, Windows Vista, Windows 7, Windows 8, Windows 8.1 and Windows 10. Fixed a bug so it now also works with AutoCAD 2015 and newer versions. 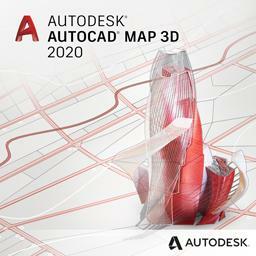 Support for AutoCAD 2014 added. Added support for AutoCAD 2010 and verticals that now save these settings with the profile. Only the current profile is updated. 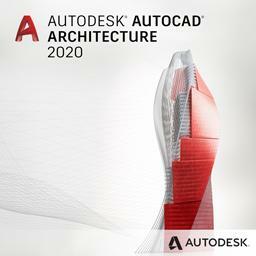 Added support for AutoCAD LT products. If you want customized apps like this created for your company please contact us.